The kids had the day off from school today. So, of course, that meant we'd be making cookies together (an activity we all look forward to). Given the right jobs, kids make great little kitchen helpers - measuring, stirring, scooping, and tasting. And the kids will unfailingly love whatever it is they've had a hand in making. 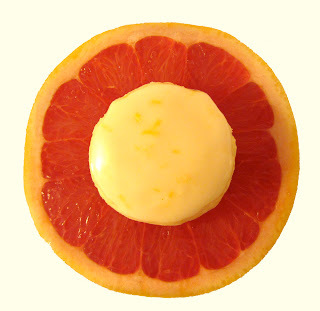 Today's cookie was Grapefruit Meltaways. The recipe was inspired by The Modern Baker. They're yummy little iced butter cookies, tasting of delicious sweet grapefruit with a hint of almond. The texture is light and melts in your mouth. The recipe is very easy - perfect for baking with your little ones. It is also very customizable - you can switch out citrus and extracts as you please (though I urge you to try the grapefruit - it makes a really great cookie). 2. In a medium bowl, whisk together the flour, cornstarch, baking powder, and salt. Stir in the zest. Set aside. 3. Beat the butter in the bowl of a stand mixer until creamy. Add the sugars. Beat until light and fluffy. 4. Beat in the extracts. Beat in the yolk. Beat in the egg. Stop the mixer, scrape down the sides and bottom of the bowl. Beat until well blended. 5. Add the flour mixture to the bowl. Beat on low until the dry ingredients are just incorporated. 6. Scoop tablespoonfuls of the dough onto the prepared baking sheets, leaving about 1" of space between each. 7. Bake for 5-7 minutes or until the tops are no longer shiny. Transfer the cookies immediately to racks to cool. 8. For the Icing: combine the powdered sugar and juice in a medium bowl. Whisk until smooth. Whisk in the zest. 9. Dip the tops of the cookies in the icing, letting any excess drip off. Set right-side up on the rack. Allow the icing to set. Serve!